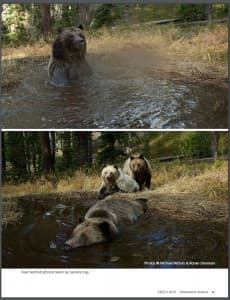 Yellowstone National Park scientists and photographers working for National Geographic have documented a “bear bathtub” used by grizzlies to cool off during the summer. Park researchers discovered the pool some years ago while retrieving a radio collar that slipped off a grizzly. An air search over the backcountry of the world’s first national park revealed the approximate location of the collar. Park workers later visited the site with a hand-held receiver to pinpoint and collect the transmitter. The discovery and photographs are part of the latest edition of Yellowstone Science, a collection of articles regarding research in the federal reserve. The issue includes an article about critter-cams fitted to radio collars on black and grizzly bears, offering views of things that are about to get eaten. 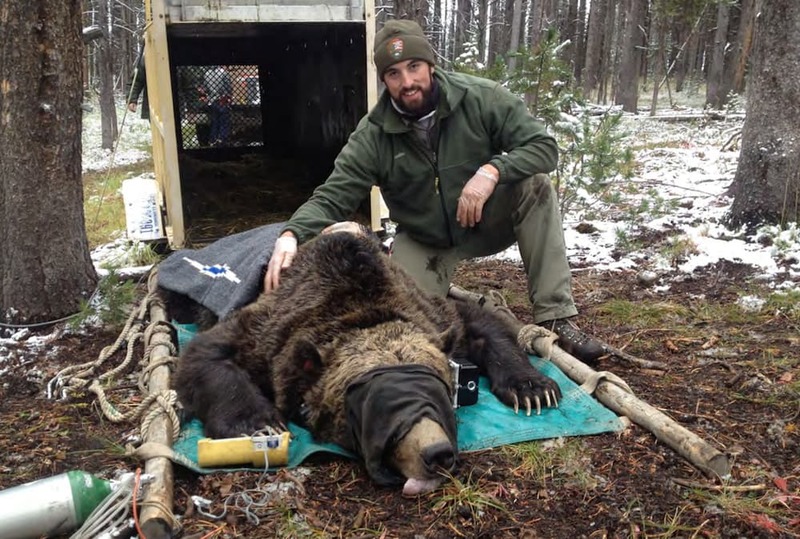 Yellowstone’s bear management biologist Kerry Gunther edited the issue. Among the topics covered in the 100-page annual are a review of 40 years of grizzly bear recovery and a piece on bears’ omnivorous diet. Other stories cover the decline of whitebark pine, changes to grizzly demography and how the imperiled species responds to changing food supplies. Authors wrote about the rate at which hikers arm themselves with bear spray and how grizzlies respond to increasing numbers of visitors. “The chances of being injured by a grizzly bear while staying in a roadside campground in Yellowstone is approximately 1 in 22.8 million overnight stays,” he wrote. Along with the critter cam, the bear bathtub story adds delight to the fascinating lineup of scientific information. 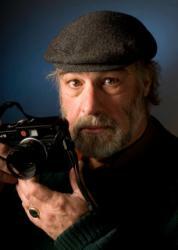 U.S. Geological Survey biologist Mark Haroldson, National Geographic photographer Michael Nichols and Bozeman, Montana photographer Ronan Donovan shared the byline. Do grizzlies strip when bathing? When researchers retrieved the sunken radio collar years ago they noted the pool to be about four by ten feet and up to three feet deep. National Geographic magazine is publishing a series of articles on America’s national parks this year, and an issue on Yellowstone is scheduled for May. Bears played in the pool, brought their cubs along, and marked the area with scent. “It appears that bears enjoy a nice cold soak on a hot summer’s day as much as humans do,” the article says. Since biologists found the bear bathtub, they have retrieved other collars from small, cold ponds. There may be a number of places in the park where bears go to bath, play and mark their scent. 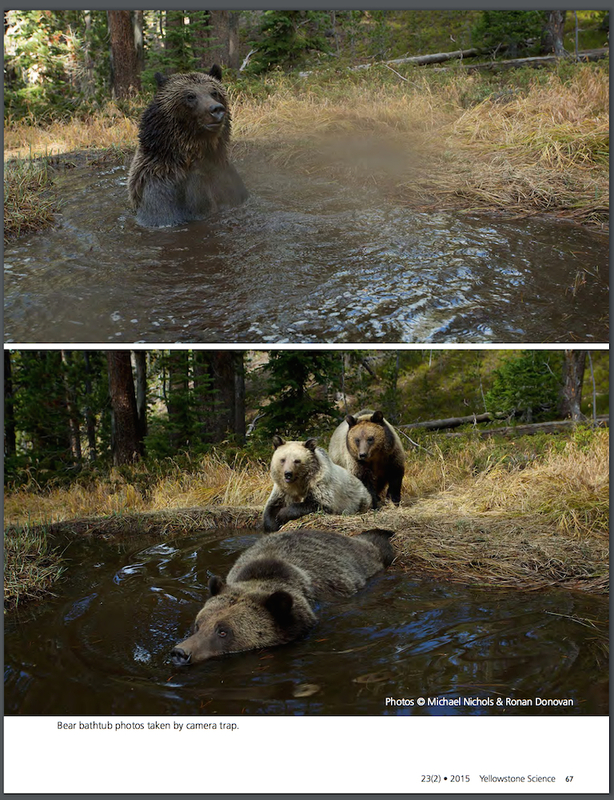 “The bear bathtub is just one of the many special places in Yellowstone National Park that grizzly bears have helped us discover,” the authors said. So the Seattle city gov , thinks it’s a good idea to install GRIZZLY’S in the North Cascades,? like they are not already HERE, duh, I have seen them up close. WE WILL SEE. I think this shows that Grizzlies are far more sentient and intelligent than we know. Maybe even more so than Mr. Antelope. This makes me sick. Encumbering wild animals with collars and cameras for frivolous and pseudo-scientific reasons is abusive and rampantly out of control. This mocks the founding principles of the national park system. The fact that wildlife biologists and photographers outnumber wildlife does not give them the right to exploit these creatures for profit, amusement and self-promotion.